The success of any business is determined by its ability to build an effective team. What better way to do this than via team building? Many businesses are now investing in team building, not because it is in vogue, but because it is a win-win situation for both the employer and employee. The benefits of team building are long-term. It passes across a clear message that you, the employer, are ready to invest in your employees as well as their success, which makes them more motivated, increasing productivity – the main goal of team building. Before we get to understand team building benefits and productivity, let’s delve into what productivity entails. Productivity is the quantity and quality of work completed in a given period of time. To be productive, any member of an organization must be motivated. Motivation goes beyond the paycheck. The paycheck is very short-term when used as an incentive. A better way to ensure productivity is via team building programs. Activities in team building programs allow people to utilize their talents. When working with a corporate team building program the team is encouraged to perform at their best. The members learn that diversity is an asset and, if well harnessed, diversity can produce great results. The team members learn how to use each other’s strengths to work toward a common goal. Once the hidden potential is unleashed, the team members become more confident in their abilities. These talents will improve motivation and ultimately productivity when applied to daily tasks at work, school, or any other institution. Team building allows team members to experience a sense of accomplishment by working as a group to accomplish a challenging task. This way, their problem-solving skills are added to their repertoire. Moreover, barriers between individuals are broken. People who have never worked together get to participate in a team, a way of being encouraged to interact, which bonds them. When they go back to work, they will be ready to help one another accomplish both individual and organizational goals. The group learns new ways of working together. Team building activities give team members firsthand experience with the effectiveness of good communication. They also develop new ways of ensuring that effective communication is maintained. Every member in a team has a role that they are naturally suited for. Team building helps better define these roles, so that each member focuses on what they are good at and develops that specific talent. This way, each member performs their best in their niche, while working towards the ultimate, common goal. Team building allows employees to develop new skills, which may not be possible in a busy work or school environment. Team building activities provide the ideal opportunity for development of leadership skills, as well as skills in other areas which may be helpful in the business or institution. Since team members work together towards a common during team building activities, it becomes easier for them to form better working relationships within their work environment. All team members participate in activities where they have equal knowledge about the task. It calls for collaboration in working together in close proximity, thus, creating a positive environment where people can form healthier working relationships. With healthy working relationships, productivity is undoubtedly enhanced, as people can work based on mutual trust and confidence. Better still, teamwork brings with it a social aspect, where people feel good working together. Members of a team rely on each other to accomplish a shared goal. They encourage one another, assist each other and support each other to achieve goals. Just as a football team needs all of its players to support each other to score touchdowns – a productive working environment involves support amongst all members. Not doing so disrupts the cohesiveness of the unit, in turn, decreasing productivity. Every member of the team brings different knowledge and information on board. This way, a more holistic approach is used in problem solving. Improvements on existing services or products may also result from discussions and brainstorming. A company may actually “stumble upon” a new product or service that they can offer as the team members participate in a particular team building activity. Moreover, since the members will be motivated, they will be more willing to bring to the forefront more ideas that will help improve the company’s products, services, and/or management. Team building highlights individual strengths, which, when combined, result in quicker response to change. Team building gives people a sense of belonging, keeps the team focused on the mission, helps them achieve more with less, and saves on time and money. Better still, it ensures better utilization of resources and production of better ideas. All these factors maximize productivity, and of course, profitability. Team building results in unity among individuals and departments, making people work together, pulling in the same direction, which ultimately increases productivity. It combines the effort of a number of individuals, thus more is accomplished within a shorter timeframe. Tasks and roles are also divided to ensure that each particular area is addressed by individuals who are proficient at them. This helps address an issue more thoroughly. Moreover, team building will renew purpose. It reminds people why they are in the organization and how their individual and corporate contribution is important. Team building helps people take collective responsibility for outcomes, thus there is a greater sense of accomplishment. The importance of team building cannot be overemphasized. If you are looking for a motivated, focused, energetic, enthusiastic team that works towards goals, you must look beyond salary increment. Team building benefits and productivity can be seen across institutions- schools, colleges, sports, scouts, and businesses. It is no longer about individual accomplishments. It is about teamwork- which is achieved via team building. Terrapin Adventures provides professional team building programs to help your team perform at its optimum level. 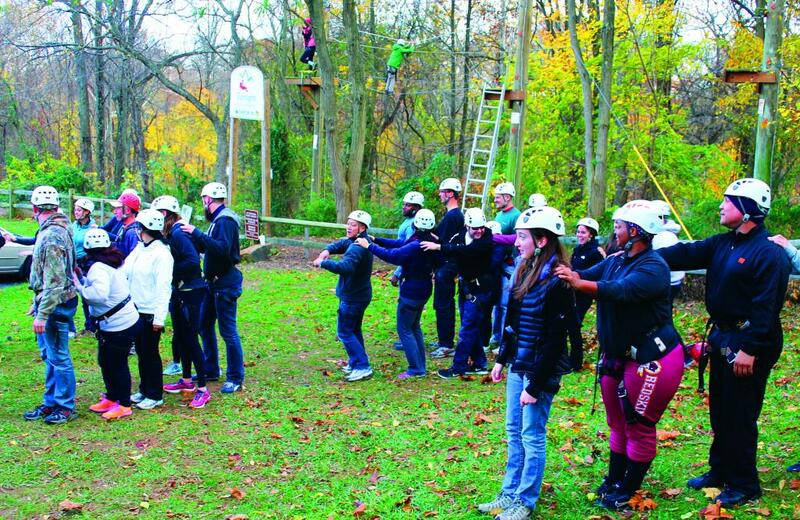 Located between Baltimore and Washington DC, Terrapin Adventures is uniquely suited to provide a Team Building solution for any company, both onsite and offsite. You can take advantage of our Adventure Park – Zip Line, Giant Swing, Climbing Tower, low and high ropes courses – or we can come to you. In the meantime, if you have any questions about Team Building, please call Terrapin Adventures at 301.725.1313, email us at info@terrapinadventures.com, or fill out the contact form on our website. You can also follow Terrapin Adventures us on Facebook, Twitter, LinkedIn, YouTube, Google+, and Pinterest for up-to-date information on events, trends, and other fun and exciting outdoor activities. This entry was posted on Friday, January 23rd, 2015 at 2:19 pm. Both comments and pings are currently closed. I love the section on “creates new and beneficial experiences”. That was very insightful, I never thought of building trust by completing non-work related tasks. The point about improving communication was also very interesting to read. This list of benefits is very helpful when it comes to learning about how to build a functioning team. Great article – especially agree with the section about motivation coming from more than simply salaries. A wage packet only goes so far in encouraging commitment and improving morale.